Featured Artist for March 2018 on the National Women's Caucus for Art website. January 2018: Dancing in Color: Paintings by Marcia Santore, Artist + Writer, The Remembered Arts Journal winter 2018 issue "Joy"
A goblin is happily making salt-crystal “bling” for himself, until he spots the nymph’s green glass beads and is overwhelmed by desire for them. He asks for the beads, he demands the beads, he whines and begs for the beads. But the nymph has her own purpose for the beads, using them to do her science–magic … Marcia Santore’s colorful pictures retell the story of Overheard on a Saltmarsh, introducing Harold Monro’s beloved poem to a new generation of children, while raising an important question: Just because some guy asks you for something, does that mean you have to give it him? Children (and adults!) will identify with the envy and desire of the tantruming goblin on the one hand, and with the serious-minded work of the gentle but firm nymph. The book also provides an opportunity to talk with children about when sharing is important and when maintaining personal boundaries is important, as well as the difference between “want” and “need.” And that sometimes the right answer is "No." Don’t miss the salt crystal-making activity in the back! 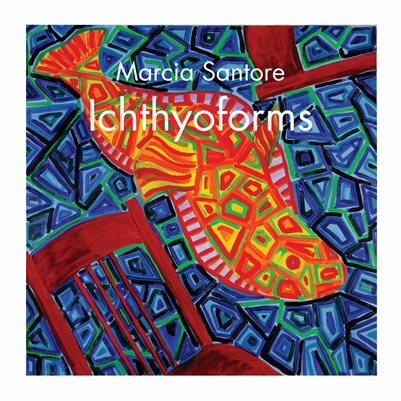 November 17, 2017: Valley News "Art Notes: New D-H Center Opens Exhibitions"
October-November 2017: Marcia Santore will have two solo painting exhibition of two different bodies of work in two different states during November 2017. INEXTERIORS, which features visions of impossible architectural spaces, opened on October 16 at the O'Brien Art Gallery at Roane State Community College in Harriman, Tennessee, and runs through November 30. PATTERN IN MOTION, which opens October 28 at the University of Connecticut-Stamford Art Gallery and runs through December 1, addresses color and vertiginous, nonrepetitive pattern in works that balance on the indefinable point between recognizable subject matter and complete abstraction. January 12, 2017: An Interview with Marcia Santore by Kate Higley. " ... ​My primary aim is to keep exploring—I think exploration and discovery are at the heart of the art-making process. ..."
April-May 2017: A Little Abstracted, curated by Marcia Santore, at Twiggs Gallery, Cornerstone Design, Boscawen NH. Featuring small(ish) abstract work by Ethel Hills, Lotus Lien, Kate Higley, and Marcia Santore. March-April 2016: "Too Late" shown at Woman Made Gallery ​in Chicago, Illinois as part of the exhibition "One in Herself"